Dr. Maher Naji has more than twenty five years of experience in dental surgery. He successfully completed the American and Canadian board certification. Dr. Naji successfully completed one year of extensive training in the field of Implant Dentistry in Atlanta, Georgia. He then completed a comprehensive training maxi-course program in oral rehabilitation and received his training and certification in intravenous sedation and advanced cardiac life support. Dr. Naji is a member of the Academy of General Dentistry (AGD) and a member of the American Academy of Implant Dentistry (AAID) and has completed different courses in the surgical extraction of wisdom teeth, endodontic therapy for root canals, periodontal surgery, cosmetic dentistry, laser dentistry, and Invisalign orthodontic clear aligners. 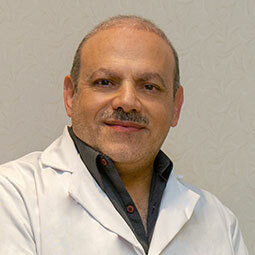 Dr. Naji has established his own dental practice in 2011; Canadian Place Dentistry in Mississauga which was sold in 2016. He currently works as an associate in Fenworth Dental and Dentistry on the Mountain located in Hamilton. He focuses his practice on providing the highest standards of care, comfort, and accessibility. Dr. Naji is fluent in both English and Arabic, and in his free time he enjoys swimming and playing soccer. Dr. Naji and his wife have four kids. He looks forward to treating your dental needs, and makes it his mission to provide you a smile with lasting impressions.